Fish, either produced through fish farming, aquaculture or caught from wild marine or freshwater stocks, is a primary source of protein and essential nutrients. It is increasingly recognised as an important part of the food security chain, and continues to provide income and livelihoods for millions of people across the world. But the need to address this growing demand for fish, puts pressure on natural resources and challenges the sustainability of marine and inland fisheries. “Sustainable fishing” may sound simple enough, but measuring whether or not a fishing operation is sustainable is actually quite complex. It requires plenty of research and data. The Marine Stewardship Council, a body which works to reverse the effects of overfishing, has a useful resource, Seafood Matters. This outlines just how a “maximum sustainable yield” (the maximum catch that can be harvested sustainably) is calculated for each fishing population. And how it can drive positive change in order to manage natural resources. Today fish provides 3.0 billion people with almost 20% of their average per capita intake of animal protein, though this can exceed 50% in some regions. In some West African coastal countries for example, where fisheries have historically been a central element in local economies, the proportion of total dietary protein from fish is more than 60% (the Gambia, Sierra Leone and Ghana). Likewise, in Asia, where fish farming has developed rapidly over the last 30 years, total dietary protein from fish is between 50 and 60 percent in Cambodia, Bangladesh, Indonesia and Sri Lanka. More than 120 million people depend directly on fisheries-related activities (fishing, processing, trading), over 90% of whom are employed in small-scale operations, in developing and emergent countries. It is clear that employment in small-scale fisheries is several times higher per tonne of fish landed than in large-scale fisheries. they are a key means to sustain livelihoods of marginalised and vulnerable populations in developing countries. The importance of small-scale fisheries (including inland fisheries) in terms of overall production and contribution to food security and nutrition is often underestimated or ignored. Catches from subsistence fishing are rarely included in national catch statistics. There is, however, sufficient evidence to support a focus on small-scale fisheries for food security and nutrition interventions in developing countries. Larger-scale industrial fisheries can also directly contribute to the food security and nutrition of the poor in developing countries and revenues generated by large-scale operations can also contribute indirectly to food security through employment creation. But small- and large-scale fleets (e.g. 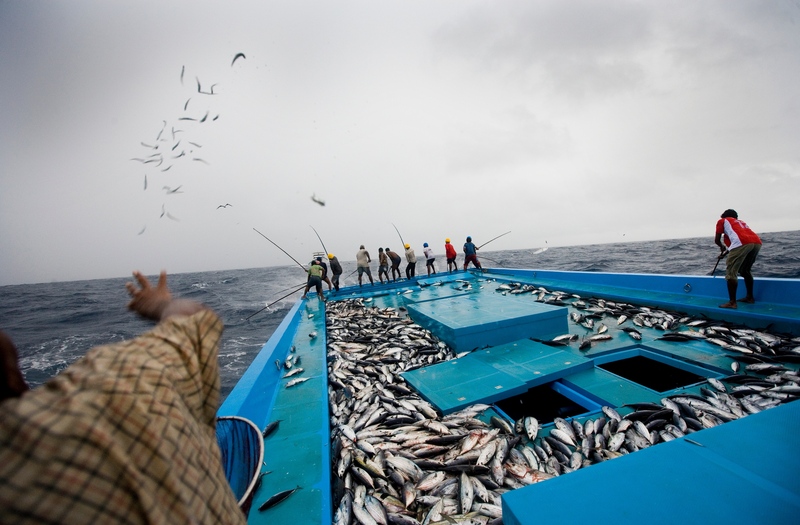 trawlers) do compete for resources, fishing zones and gear, leading to conflicts in zones where they jointly operate. In most cases this increases small-scale operators’ vulnerability, threatens their well-being, incomes and food security, and can also negatively impact on coastal habitats.